Venezuela is the most tragic case at present that the Western and particularly the US meddling and sanctions have produced with disastrous social effects. The situation in Venezuela is more complex than what it appears. There are two major crosscurrents in operation. First is between President Nicolas Maduro’s national government and the US, the latter attempting to exploit the existing crisis to bring Venezuela under its economic and political control with the backing of other Western powers. Second is between the authoritarian regime of Nicolas Maduro and the opposition led by Juan Guido that dominates the National Assembly or Parliament of elected representatives. In the second case it is also a conflict between the executive presidential system and parliamentary democracy. The most irony is that both Maduro (United Socialists) and Guido (Popular Will) belongs to two socialist parties in the country although the latter has not clearly expressed his socio-economic programme to the people yet. He is mainly representing the joint opposition in Parliament. Their main campaign is to bring democracy to the country which is terribly lacking particularly under Maduro. What complicates the situation and raises doubts about Juan Guido’s intentions are his collision with some of the Western powers and particularly the US. Given the history of the country, crisis within the economic system, poverty and living difficulties of the broad masses and concerns of the people within and outside the country on democracy and human rights, the best option would be for all parties to dialogue and come to an understanding in holding both presidential and parliamentary elections without delay and also without confrontation and violence towards resolving the situation. It appears that undue interference from outside can both derail and distort the situation in the country further. US interference in Venezuela and Latin America in general is long standing going back to the Monroe Doctrine (1823). The US wants to consider Latin America as its backyard which is resisted by many governments including those who are opposing President Maduro at present. What is wrong with Western policies towards Third World countries in general is not that they express concerns or even influence on democracy or human rights, but they try to impose policies, solutions, values and political changes disregarding the social conditions, political independence, cultures or people’s wellbeing in those countries. Their sanctions most of the time are like punishing the poor. It is not partnership that they aspire for, but subjugation or submission. It may be possible that in the case of some people or organizations this is not that conscious or intentional, but that cannot be said about most of the governments, politicians or even some organizations. If not racism, at least some form of superiority complex seem to govern their behaviour and views, underpinning economic and ideological interests. There is no question that Venezuela is lacking in democracy at present. The policies and practices of President Nicolas Maduro or the ruling United Socialist Party are ideologically authoritarian although socio-economically socialist. This has been a perennial problem in most of the socialist parties and regimes in the world beginning with the former Soviet Union. This is also the nature of many socialists and socialist parties in Sri Lanka, either practicing authoritarianism themselves or aligning with authoritarian political leaders most of the time. However this is not a reason for the outsiders like the US to meddle in the internal affairs of Venezuela or any other country, if the US is truly democratic. The democratic problem or the contradiction in socialism is something that the socialists themselves should rectify, although there is nothing wrong in others pointing it out. On the other hand, what the world politics or international relations show is that although the countries like the US are internally democratic (yet to an extent), their foreign policies and actions are completely authoritarian or even dictatorial. We have seen this in Palestine, Vietnam, Cambodia, Iraq, Afghanistan etc. In the case of Latin America, this has continuously been the case and there had been direct military interventions in most of the countries throughout years making Latin America virtually a region of political and economic chaos. The feelings of the people against American ‘imperialism’ is depicted in the attached street drawing in Caracas. Who is primarily responsible for the current crisis and chaos in Venezuela today? Large responsibility should go to the United States because of their sanctions while the internal regime is also equally responsible. When Hugo Chavez won the presidential elections in 1998, it was through a mass upsurge of popular aspirations for national sovereignty and socialism that it happened. It was a democratic election no less than any American election. It overturned America’s theory of ‘end of history,’ Chavez initiating twenty social missions in the name of Simon Bolivar and other national figures and ‘heroes.’ Significantly, none of these were in his name or his family members! Not that I completely agree with Chomsky, but what he said had some truth. During the oil boom, there was an expanding middle class who wanted more and more capitalism or market, instead of socialism or state control. This was apart from the social missions or socialist programmes that Chavez initiated. There was no effort to strike a balance. More pertinently, after Chavez (2013) there was a rapid deterioration of socialist policies under Maduro. This is one reason why there have been splits and defections within the United Socialist Party giving rise to many socialist parties and groups to emerge. If Maduro is socialist, he is of the old type. There are others in the opposition who want to bring neoliberalism to the country. The situation is complex. There is obviously a constitutional crisis in the country. The National Assembly or Parliament was elected in 2015 with the opposition dominating and Juan Guido leading. The President Nicolas Maduro was elected in May 2018 marred with accusations of fraud and manipulation. Whatever the truth, both sides have not attempted to resolve the situation through the judiciary or negotiations. Many of the other Latin American countries are siding with the opposition, given Maduro’s extreme and arrogant policies. They are also perhaps eying for Venezuelan oil! In January this year the Organization of American States (OAS) approved a resolution ‘not to recognize the legitimacy of Nicolas Maduro’s new term as of the 10th of January 2019.’The US has a major influence over the OAS.It is on that basis that Juan Guido has self-assumed the position of the ‘Interim President’ without any constitutional basis. This is a measure far fetched of democratic norms and practices. To worsen the constitutional crisis further, the US, Canada and many members of the OAS and the EU have recognized Juan Guido as the Interim President, making the country having two Presidents. Instead, what they should have done is to call the President and the National Assembly to negotiate, compromise and resolve the constitutional and other issues amicably. 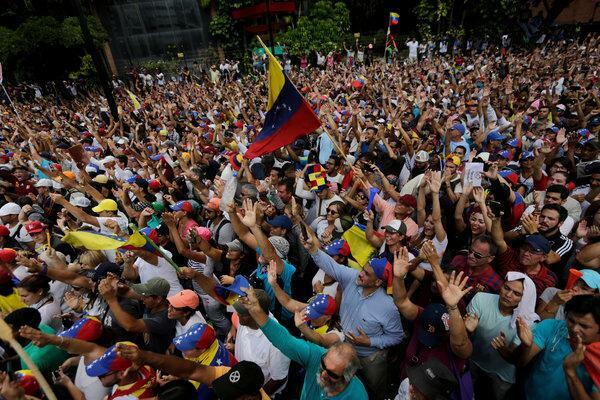 US has complicated the matters further by imposing new sanctions against Venezuela deepening the economic crisis, poverty, scarcity of food and medicine. There are undoubtedly questions about democracy and human rights under the present socialist regime complicated by the US and other Western interferences. On the other hand, Western interferences have strengthened the political defence of Maduro and his government. It is completely understandable for the organizations like the JVP to protest against the American interferences, sanctions and hypocrisy as they have done last month. However, there are serious issues about the type of socialism that Maduro and his party practices.